The study, "Purinergic receptors in the carotid body as a new drug target for controlling hypertension," was led by Julian Paton, professor of physiology at the University of Bristol, and published in the 5 September online edition of Nature Medicine. Instead of treating high blood pressure by targeting directly the functions within end organs, such as the heart, kidneys and vasculature, this novel approach aims to reduce nervous system activity from a sensory organ - the carotid body - which, when activated can cause blood pressure to rise uncontrollably. Such a treatment may offer superiority over existing medications, principally by lowering blood pressure directly at a common source. Beneficial outcomes may also extend to other cardiometabolic disorders, such as heart failure and sleep apnoea, in which the carotid bodies are known to be sensitised. In preclinical models, researchers were able to block this carotid body aberrant signaling activity with an investigational drug candidate, MK-7624 (also known as AF-219), demonstrating a significant reduction in blood pressure. "With this research, we've validated P2X3 receptors as a novel drug target for the treatment of cardiovascular disease, by demonstrating that blockade of these receptors with a selective antagonist controls carotid body activity," said Dr Angus Nightingale, a cardiology consultant, who runs the specialist hypertensive clinic at the Bristol Heart Institute, and co-author of the study. "The question now is whether blocking these P2X3 receptors in humans will lower elevated blood pressure, and how we can best identify those patients with carotid body hyperactivity who are most likely to respond to treatment." "The carotid bodies lie at the bifurcation (fork) of the common carotid artery on each side of the neck and are the body's smallest organs, each about the size of a rice grain," said Professor Paton, who co-led the research with Dr Anthony Ford, founder and chief scientific officer of Afferent Pharmaceuticals. "These organs sense chemicals such as oxygen in the blood. When oxygen levels fall, the carotid bodies become active and send signals to the brain that trigger increases in breathing and blood pressure." "In healthy individuals, the carotid bodies have very low levels of activity," said Professor Paton. "We discovered that these tiny organs become hyperactive in conditions of hypertension, generating what we have called aberrant or tonic discharge, which is sent into the brain regions controlling cardiovascular activity. In this way, changes within the carotid body may be a cause of high blood pressure and therefore represent a novel target for controlling blood pressure." 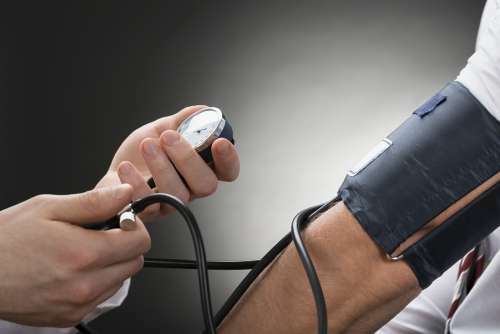 To carry out the research, the team utilised an established animal model of human hypertension. They discovered the energy molecule ATP (adenosine triphosphate), a recognized common signaling nucleotide, was able to persistently activate the P2X3 receptor, and that this protein was upregulated by almost 5 fold in the carotid body in hypertension. By blocking this receptor in the carotid body with MK-7264/AF-219, blood pressure fell significantly in hypertensive rats. "Crucially, unlike carotid body removal, the drug did not render the carotid body inoperable," said Professor Paton. "Instead, it normalized its activity levels to those found in a normotensive state. Think of it in terms of a domestic fire alarm – it switches off after the smoke disappears, but the battery remains in place, meaning it can still respond in an emergency." "We have developed some unique tests to assess the activity state of the carotid body in human hypertensive patients," said Dr. Nightingale. "We are hoping to initiate a clinical trial to test P2X3 receptor antagonism in hypertensive patients who exhibit hyperactive carotid bodies in the near future." "This approach may be the first novel anti-hypertensive treatment strategy in more than 15 years, and perhaps the first directed at a root cause of excessive sympathetic discharge to cardiovascular end-organs," said Professor Paton. "This research was translational from molecule to medicine, and reflects the critical importance of integrative physiology as a subject. Our study was an inter-disciplinary team effort, and would not have been possible without close working with colleagues from the University of Bristol, University Hospital Trust Bristol, the University of Sao Paulo, Brazil, the University of Auckland, New Zealand, and Afferent Pharmaceuticals. Nor would it have been possible without funding from The British Heart Foundation and Afferent Pharmaceuticals."